Abstract: The Gary Leonard Colasanti Papers contain materials pertaining to the funeral and memorials for Gary Colasanti, one of the 35 students killed in the bombing of Pan Am Flight 103 while returning from studying abroad through Syracuse University's Division of International Programs Abroad (DIPA). 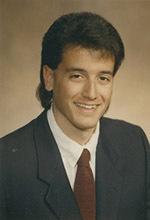 Gary Leonard Colasanti (1968-1988) was among the 270 victims of the bombing of Pan Am Flight 103 over Lockerbie, Scotland on December 21, 1988. He was a junior at the S.I. Newhouse School of Public Communications at Syracuse University majoring in advertising. Gary was an avid skier who lettered in soccer and tennis in high school. He was also an artist from a young age and received a certificate of merit from the Boston Globe Scholastic Art Awards in 1985. Gary was a member of Sigma Alpha Epsilon fraternity. Gary is remembered by family and friends as "caring, warm, and very special. His ever-present smile and unique sense of humor touched the hearts of many." Gary was survived by his parents, Leonard and Joanne of Melrose, Massachusetts, as well as a sister, Karyn, a brother, Paul, and a paternal grandmother and maternal grandfather. The Gary Leonard Colasanti Papers contain three series Clippings, Photographs and Subject files. All items in the three series pertain to the funeral and memorials for Gary. The eulogy given by Gary's father, Leonard Colasanti, at his funeral can be found in Subject files. The Clippings series contains folders for obituaries and for a memorial scholarship fund set-up in Gary's name. The Gary Leonard Colasanti Papers were donated by Leonard and Joanne Colasanti. The Gary Leonard Colasanti Papers are processed. The Gary Leonard Colasanti Papers are arranged alphabetically by and with-in each series.